The Netflix series House of Cards has announced it will suspend production following sexual assault allegations against actor Kevin Spacey. The show had already said it would end after this season, but now say they will permanently “suspend production”. The Old Vic theatre in London where Spacey worked for 11 years say they are “deeply dismayed” by the allegations. 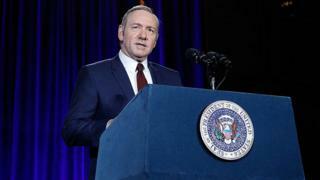 Spacey, who is also executive director of House of Cards, said he owed Rapp, now 46, a “sincere apology” for what he said would have been “deeply inappropriate drunken behaviour”. Spacey also announced that he was now living “as a gay man”, but the Oscar-winning actor has been widely criticised for choosing this moment to come out. House of Cards, which is based on a BBC programme, first debuted in 2013. Does the Bridge Theatre’s opener deserve top Marx?